Ripe avocado and shrimp make a great refreshing summer salad. 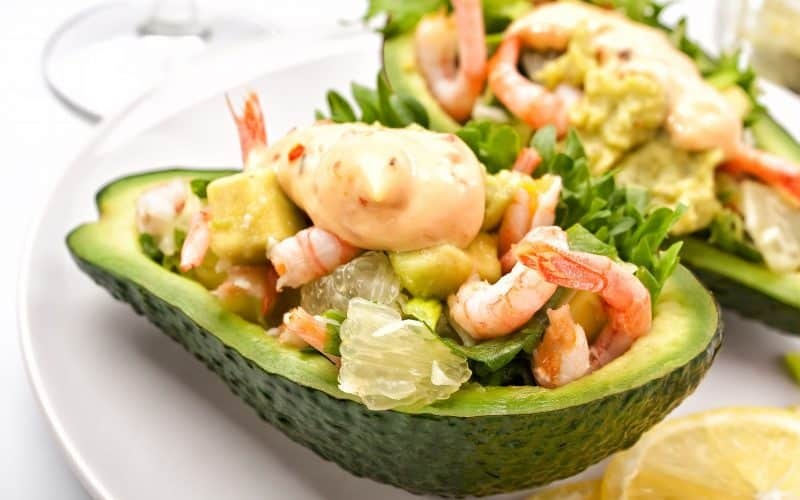 In France, shrimp avocado salad recipe are sometimes served with an American cocktail sauce. This shrimp avocado salad can be served as a meal starter or for a light lunch (although in this case we recommend doubling up on the shrimp). Check our detailed recipe and Art of the Home suggestions below. Enjoy and bon appétit! Cut avocado in half lenghtwise, remove pit. Carve out avocado flesh and cut in large chunks. Mash with a fork or muddler. How much you mash depends on how chunky you want the avocado puree to be. Add chopped shallots, lime juice and a dash of olive oil. Salt & pepper to taste. In a small bowl, mix mayonnaise and ketchup to make the American cocktail sauce. Line carved out avocado with lettuce leaves. Using a spoon, divide evenly the avocado chunky puree between each avocado halves. Place 6 shrimp on each avocado and top with a teaspoon of American cocktail sauce. Variations: add a pinch of cayenne pepper to the American cocktail sauce to give it a bite. Serving your shrimp avocado salad for lunch: serve extra shrimp in a separate serving bowl with fresh bread and a small bowl of extra American cocktail sauce.